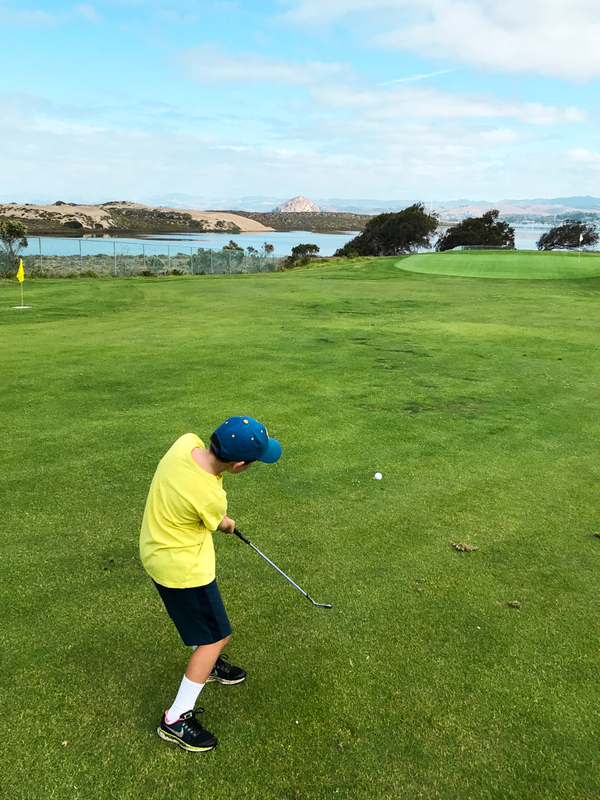 Photo: Matt Kettmann The author’s son, Mason, tees off at Sea Pines Golf Course in the morning and jumps in Montaña de Oro tide pools in the afternoon. The resident Clubhouse Grill is an all-day affair, serving craft beers late into the night as well as big breakfasts like chicken-fried steak and chilaquiles to uplift the slower mornings that may result. We happened to visit during one of its popular Saturday afternoon concerts — it went down right outside our door, so we watched folks of all ages dance on the putting green while sporadically dipping into the comforts of our two-room suite. Photo: Matt KettmannThere’s great grub and BYOB wine at Noi’s Little Thai Takeout. Our sit-down dinner on Saturday landed at the top table in town, which must be one of the best in all of San Luis Obispo County: the Blue Heron (blueheronbaywood.com), located downstairs from the Back Bay Inn and across from the humorously diminutive Baywood “pier.” “Contemporary coastal cuisine” is the game, from oysters and smoked fish rangoon to quinoa-crusted scallops, but the non-fish dishes are prime too, including house-made pasta and homegrown veggies. The wine list could keep me there for days: bubbles from the Jura and Tasmania, chenin blanc by Thacher, chardonnay by Deovlet, syrah by Stolo, and much more from both near and far. More tempura fish tacos, and that Baywood Burger too, please! Photo: Matt KettmannThe Kettmanns paddle across Morro Bay. Upon returning to the harbor an hour later — windblown but not shark-bitten — we sipped on sour beers and chowed on mussels and fried artichoke hearts at The Libertine Brewing Company (libertinebrewing.com). Then I bought a wide-brimmed, hipster-ish hat that was handmade nearby. It’s an enduring reminder of our weekend away in a community just enough apart, but so close to home.